Thanksgiving Dinner is Served! - San Diego Dining Dish! Thanksgiving is just around the corner, and I am getting ready for the parade and turkey! I'll be cooking up a storm, but for those of you who prefer to let someone else take care of the cooking while you relax with loved ones, here is a list of San Diego's greatest hits for Thanksgiving! While you may be planning for the Black Friday madness already, don’t forget about the equally exciting night of Black Wednesday. 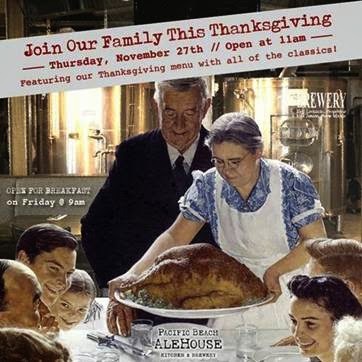 Since this Thanksgiving will be free from hours of stressful cooking, there’s no reason not to start your celebration early – the folks at Pacific Beach Alehouse sure will at their Thanksgiving Eve party on Wednesday night. Headed to Hillcrest? Drop by Uptown Tavern for their Thanksgiving Kickoff party starting at 9PM, featuring DJ Joey Jimenez. Besides, your rich, hearty Thanksgiving feast the next day will be the perfect hangover cure, so no excuses! Is your stomach already in holiday grubbing mode before the big day? Union Kitchen and Tap Gaslamp has you covered. While it’s not open on Thursday, Chef David Mango whips up some of your favorite Thanksgiving dishes on Wednesday, from 5 pm to 10 pm, to get you ready for the much anticipated Turkey Day meal. Make reservations now to claim your spot. Keep this Thanksgiving meltdown-free by staying out of the kitchen, and dining in where the professionals spoil you with impeccable homemade dishes. All you have to do is dig in! For those who participated in the madness of Thanksgiving Eve parties, nothing says speedy recovery better than a classic, three-course Thanksgiving feast. That’s why Pacific Beach Alehouse is ready to kick off Turkey Day celebrations at 11 am on Thursday so you can get your fix of comfort food before you even have time to feel hung over in the morning. Better yet, this beachside bar opens at bright and early at 9 am on Black Friday so you can refuel after the morning shopping mania. 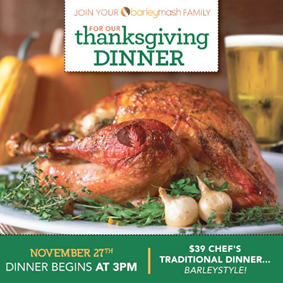 Early birds should flock to barleymash for its traditional, family-style Thanksgiving feast, starting at 3 pm. For $39 per adult, dinner comes complete with all your holiday cravings, made with the restaurant’s signature ‘barley’ touch. True North Tavern also welcomes early diners on Turkey Day by opening from 5 pm till close. With live music performances and the laidback vibe, it’s the perfect spot for you and your family to enjoy a Thanksgiving sans chaos. Everyone knows thanksgiving wouldn’t be complete without some football games blastin’ in the background. Have your classic holiday feast served fresh and steamy hot to you while you enjoy the game on any one of Tavern’s 42 inch HD TVs. Drop by to feast at 6pm and stay till as late as 2am to wash down the delicious, hearty dinner with Tavern’s signature selection of craft brews. More HD TVs and local microbrews await Turkey-hungry football fans at Uptown Tavern. Your favorite Thanksgiving entrees and desserts will be served all night, from 6 pm to 2am, so food comas are guaranteed. Attention, meatlovers! If grubbing on delicious, juicy turkey meat is the only thing on your mind, then you can do Turkey Day right at Sandbar. The popular sports grill is offering a hearty, traditional turkey dinner that’s committed to fulfill all your holiday meat cravings. Can’t make it to a family reunion? Don’t worry. 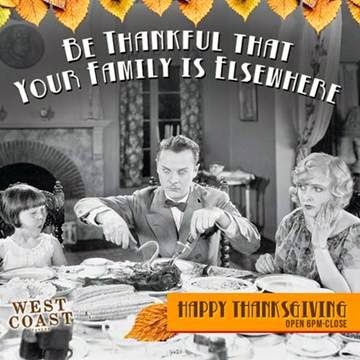 West Coast Tavern is giving you a reason to remain thankful and satisfied this holiday weekend with their Thanksgiving menu that’s proportioned perfectly for single servings. Starting at 6PM, you can grub on your favorite holiday picks tillmidnight! Of course, if you prefer to dine in the comforts of your own home with grub-friendly clothing, there are several options that take the stress out of Thanksgiving with their authentic take-out menu. With a wide variety of Mexiterranean dishes, Romesco is opened on Thanksgiving for take-out and makes the perfect place to pick up some savory tapas to spice up your home-cooked Thanksgiving feast. Hosting holiday dinners at home just got easier with Brazen BBQ’s Thanksgiving take-out menu. From the Brazen Smoked Turkey to freshly baked cornbread, Brazen has got your Turkey Day feast covered. All you need to do is order, relax and dinner will be served. What’s a Thanksgiving meal without a table full of desserts to end the night? Get creative with your sweet cravings and jazz up your dessert options this Thanksgiving with Le Parfait Paris’s delicate, artful pastries. Swing by for desserts before your family gets into town. Shhh. We won’t tell them you didn’t make those macarons and delish desserts yourself.